Ever since I got back from DC/VA, I've been chin-deep in boxes, so blogging has been slow and will be slow for a while. Also, no gaming. 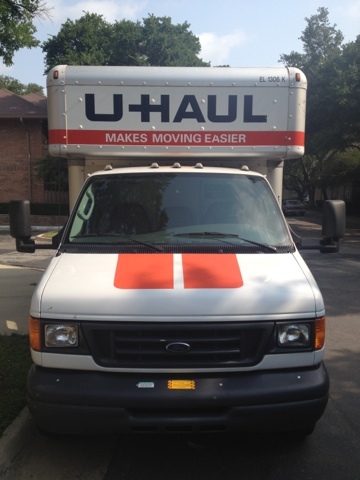 While I'll be keeping a residence in North Texas, I'm heading to the Hill Country. I'm curious to see how the Mythopoeic culture down there will compare! 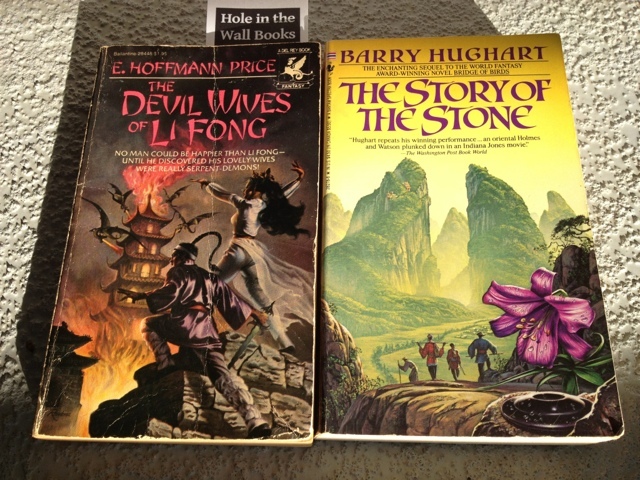 After my good fú trip to Hole in the Wall Books, I started The Devil Wives of Li Fong (1979) by E. Hoffman Price, one of the pulp writers, who later in life combined his fictioneering skills with his study of Chinese religion and culture (he became known as Tao Fa in San Francisco's Chinatown) to produce this fun novel based on the Legend of the White Snake. I finished Devil Wives this morning, and it exceeded my already good expectations. Magic, strong female characters, action, religious reflection, and intrigue are served up in this Szechuan hotpot. I think this is worth a chance even if you are not particularly into Asian fantasy, and a necessary part of any Asian fantasy lover's collection. While it's not perfectly written and perhaps a little predictable, overall it earns high marks and does a good job of conveying the fantasy reader into the ancient Chinese imagination. I found it a quick and entertaining read as well. I haven't had a lot of free time during my DC trip -- there's been lots of in-laws, extended family members from out-of-the-country, appointments, and command performances. I didn't really get to spend the time (or the money!) that I would have liked to at The Compleat Strategist (I think the Falls Church location is one of the smaller ones, but the guys there were friendly and it's definitely worth a visit), but between Mass and my next commitment, I stopped off at Hole in the Wall Books. This comic shop and used bookstore takes up all of one-story blue house on Broad St. It has an RPG selection, but I saw nothing I was particularly interested in. From what I can tell, it is a must stop for comics and fantasy/science fiction readers. In just the brief time I had to orient myself and scrounge around for the first time, I found two hard-to-find volumes I've been looking for (pictured above). Committed bibliophiles should add this to their DC area itinerary, unless they suffer from claustrophobia. I know this will be a part of my DC routine from now on. Advice: if you have allergies, take your medicine in plenty of time before you go. They've been in business for thirty-four years, and many of their books have been in business even longer. Also, wear clothes that you don't mind crawling around on the floor in. The more time you have to sort through the house's packed contents, the more you are likely to find in its tome-filled, labyrinthine corridors. EDIT: Zenopus sent me a nice list of places to check out during my visit. I filed it away, thinking, "I have no extra time (or money) this visit and will try to plan for next time," and lo and behold, Hole in the Wall was not only very close to my brother-&-sister's-in-law place, it was also number 2 on Zenopus' list, which makes for a good endorsement. Thanks for the email, Zenopus! 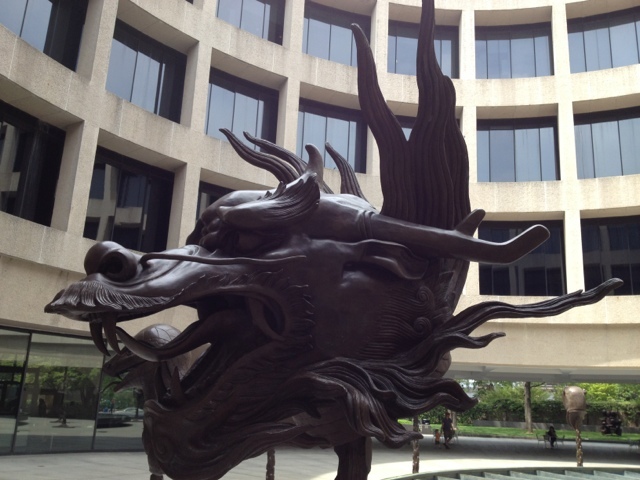 Ai Weiwei's dragon from his Circle of Animals/Zodiac Heads at the Hirshhorn. 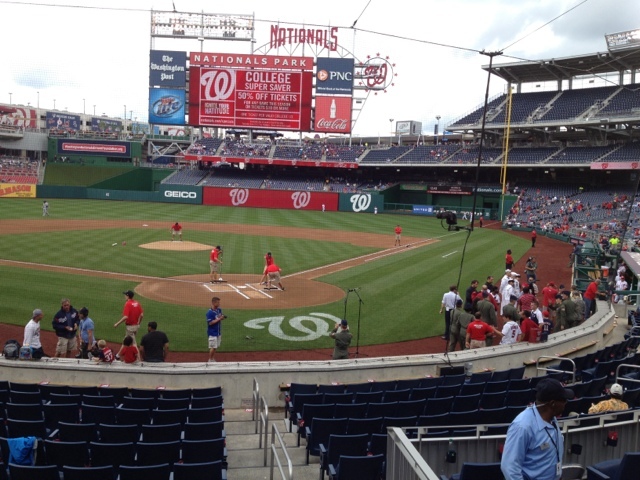 I'm in DC visiting my wife's family, and taking in a Nats game while I'm here. Not the usual kind of gaming around MR, but baseball certainly has a mythic quality here in the US. The cream of the collection is the pictured below. That's right! Of the many rust monsters and bulettes/landsharks that I had acquired as a little kid before I had ever heard the name "Gygax," one of the bulettes survived. I had hoped to find more, but even one is a minor miracle. The original inspiration for the umber hulk also somehow made it. So, I hope everyone had a great Mother's day. Me, I have lots of great memories and a rich inheritance. Not in money, mind you, but it just so happened to include some little plastic gems that will enrich future games for me and my players. Thanks for everything, Mom! Fantasy art is really thriving today all over the world. With all the crap art that has flown under the avant-garde flim-flam flag of Art that us poor middlebrow orangutans can't get, we can exult that we live in the days of Donato Giancola, Alan Lee, John Howe, Todd Lockwood, Dan Dos Santos, Luis Royo, Victoria Frances, Stephanie Pui-Mun Law, and Eva Widermann. But in addition to all the names you know are many artists you have never heard of, though perhaps you have seen their work without learning or remembering their name. They are doing wonderful work -- whether for products, patrons, or just their own enjoyment. It's appalling how young and talented some of them are and it's astounding the amount of work they are producing on a regular basis. I have been swimming in art lately, thanks to my discovery of the blog Art is the Weapon and my insane urge to view every page and track down every artist I like. They send you to places like Deviant Art and CGHub and you go crawling around amongst a visual feast, shoveling rich chocolate cake in your mouth for breakfast and then again after you brush your teeth and for every meal. I have to take breaks. I'm going to cue you in to some artist websites that I like, and also just plunk some names down for Googling. In both cases, they follow no particular order. Finally, there are artists you know and, as I intimated, forget about for awhile and then rediscover how awesome they are. Benita Winckler was a recent example for me -- if you don't know her, add her name to your web-crawling. Of course, for many of us, artists give us new perspectives on things we have already been exposed to and so their work mainly feeds the imagination or challenge our perspectives. But the more widely you view art, the more you will discover new things, as well. Case in point: Reynardine. I had never heard of werefoxes (for lack of a better word) in British folklore -- I always associated them with Chinese and Japanese folk stories. Ulafish's illustration alerted me to the presence of at least one in a British folk song, named Reynardine. 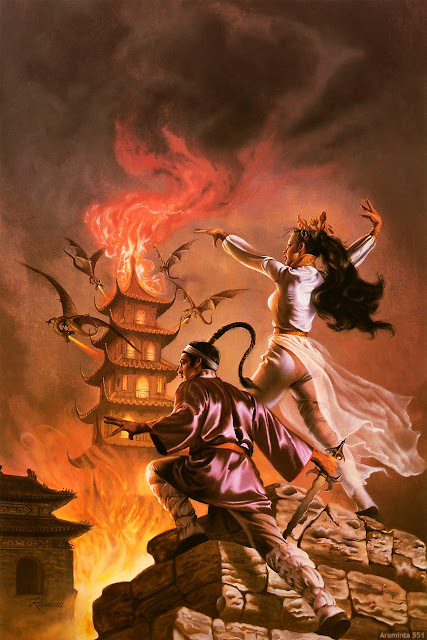 How have you benefited from the work of fantasy artists? What favorites would you share? I hope that these will enrich the visual smorgasbord that you spread before yourself when you feed your mythopoeic appetite something other than text. Finals week is hitting at the same time as preparation for my move and for teaching summer school. Did I mention that I also have an out-of-town family reunion this month and that I had to take my car in for servicing? Aarrgh! In the interests of my sanity, let me point you at some cool things to distract you from noticing that I do not really have an article for this Mythopoeic Monday. STEVEN BRUST. You know I recently finished the first three books of the Vlad Taltos series (collected as The Book of Jhereg) and I mentioned there were rumors of something involving. That something ended up being an interview of Brust by Rone and Ed on a special episode of Atomic Array. You will want to get over there and give it a listen, then check back because Brust is posting in the comments section! Very cool. In podcast land, when I haven't been listening to AA, I've been catching up StarShipSofa. There's a new feature in the series by David Raiklen on cinematic music that I highly recommend. In the same vein, I caught something on TV about Thomas Golubic that looked interesting, but Google insists that his site is harmful. Does anyone know how one can hear or see his work rescoring film soundtracks other than living in LA and going to a performance? 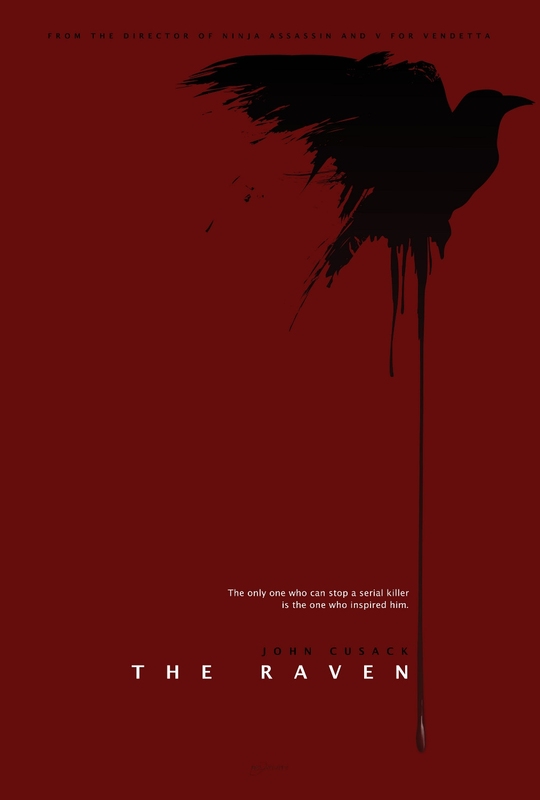 And man oh man, the reviewers are being harsh to The Raven. I think this is a case where they are being overly harsh. Critics might talk me into lowering my review to a B-, but I still had fun. Yes, we could have wished for more imaginative drawing on Poe's oeuvre, yes the author-solving-crimes-he's-inspired-trick has been used before, no, Cusak is not the best actor money could have bought for this project, but I still think it has some things going for it, as I noted yesterday. They'll probably tell me that I'm being a sucker for a period piece, but I stand by saying it's worth seeing and given a fair chance. This weekend, I took Mrs. Obscure to see The Raven. I was more entertained than she, who did not like the ending. Since this is a piece of fiction reinterpreting radically a few facts from Poe's life and disregarding others, but allowing Poe's life to end the same way, she really could not have expected a happy ending. Not to mention the fact that, well, this is a film about Edgar Allan Poe, even if it is a fictional Poe. Happiness was not exactly one of this themes. Hollywood continues to do decent by period pieces: the film captures a grimy 18th century, and I enjoyed the costuming and sets. John Cusak looks good as Poe and does a bit of scenery chewing that seems fitting for the popular figure, if not the historical one -- but even then, there would seem to be at least some historical basis for the popular notions. If you can accept creative license in the fictionalization of a historical figure, then you may enjoy this somewhat gory thriller/mystery/period piece. I did. I'm planning on grading movies from now on as if they were academic assignments: A+ to F. I'd give The Raven a B. If you enjoy Gothic imagery, I recommend it. Also, the mystery has the benefit of not being overly obvious, as many film mysteries are.